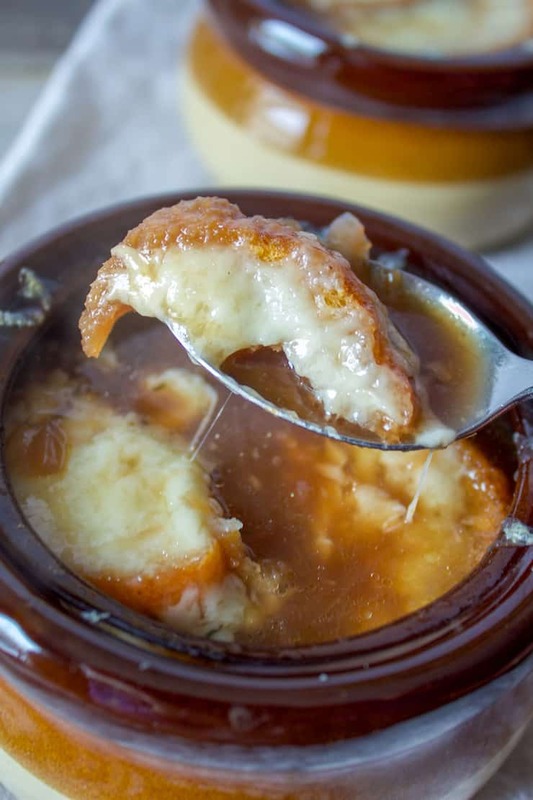 Classic French onion soup, inspired by Julia Child and tweaked just a tad, with loads of caramelized onions simmered in beef broth and wine and then topped with bread croutons and gooey, melted Gruyère cheese. 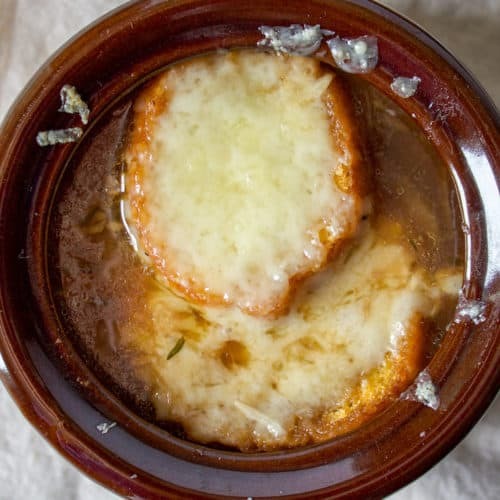 I’ve been wanting to try making French onion soup at home for years, and I finally did. Not sure what took me so long, I order it often when it’s on the menu. I guess I thought it would be too hard or something, but it’s not. Just takes some patience to caramelize the onions properly. I got out my Julia Child cookbook, studied her recipe, and then I tweaked a bit with some insights from Tyler Florence’s version. Mainly, I swapped out the white wine for red, and added a few more aromatics. I mean, I’m guessing there’s only so many ways to make a good French onion soup. I never go wrong with Julia. Be patient with the onions. They take a long time to caramelize properly, don’t rush the process. You want a deep, golden brown color and that’s going to take at least 45 minutes. 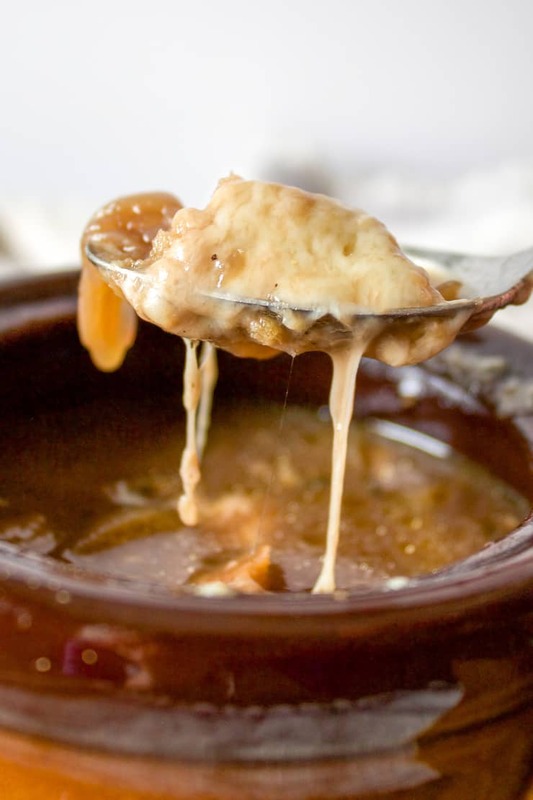 Many consider the melted cheese on top of the soup the best part. It kind of is. I toast baguette slices in the oven and then rub them with garlic. Pop a couple of baquette slices on top of the soup and generously cover with freshly grated Gruyère cheese. That’s the preferred cheese by far and you should be able to easily find it. But if you need a substitute, try emmental, jarlsberg, comté, beaufort or raclette. I’m kind of wanting to try raclette, myself. 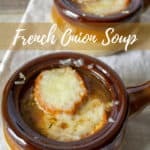 If you’ve tried this French Onion Soup, please rate it below in the comments and let me know how it went ~ I love hearing from you! HUNGRY FOR MORE? Subscribe to my Newsletter and come hang out with me on PINTEREST, INSTAGRAM and FACEBOOK for all the latest updates. 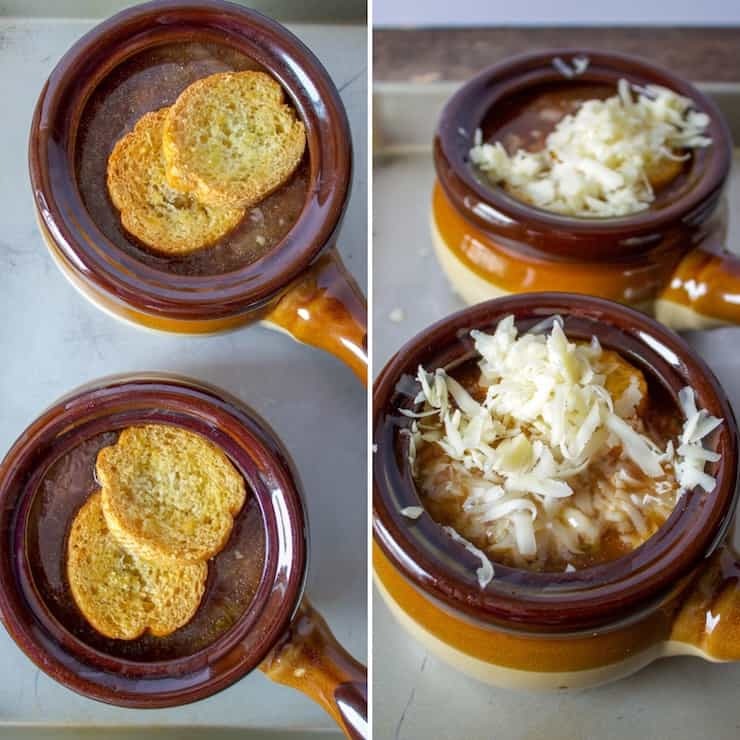 Classic French onion soup with deeply caramelized onions, beef broth and red wine, topped with baguette croutons and Gruyère cheese. Heat butter and olive oil in a large, heavy bottomed Dutch oven. 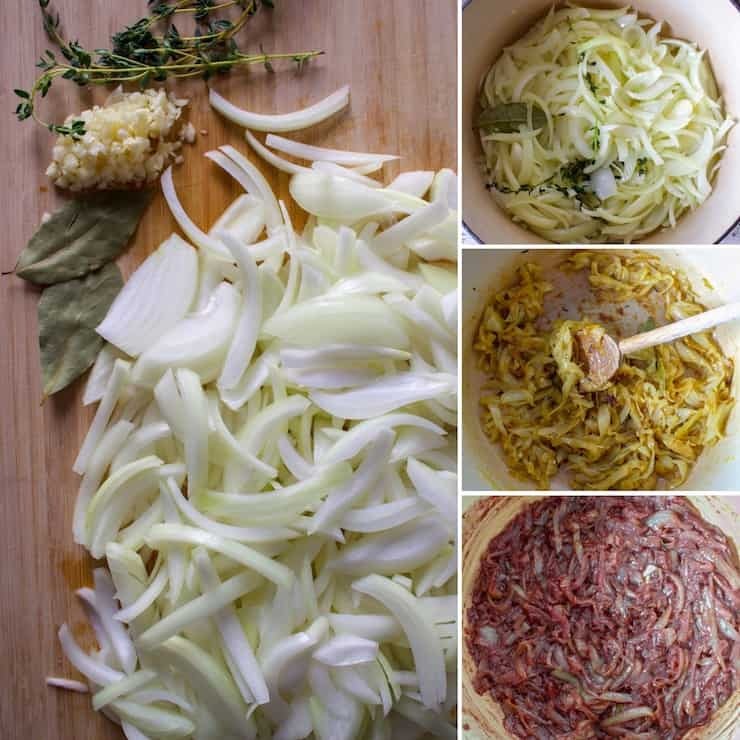 Cook onions, garlic, bay leaves and thyme, covered, over medium low heat for 15 minutes, stirring occasionally. Add red wine and bring to a boil, reduce heat and simmer until evaporated and onions are dry, about 5 minutes. Discard bay leaves and thyme. Sprinkle flour over onions, stir to combine for about 3 minutes to cook off flour taste. Add the beef broth, stir well to combine and simmer, partially covered, for about 30 minutes, stirring and skimming occasionally, if needed. Meanwhile, make croutons. Preheat oven to 325º. Place bread rounds on baking sheet and bake until crisped and lightly browned, about 20 minutes, flipping halfway and basting with a little olive oil. When done, rub each piece with cut garlic clove, set aside. Taste onion broth for salt and pepper. 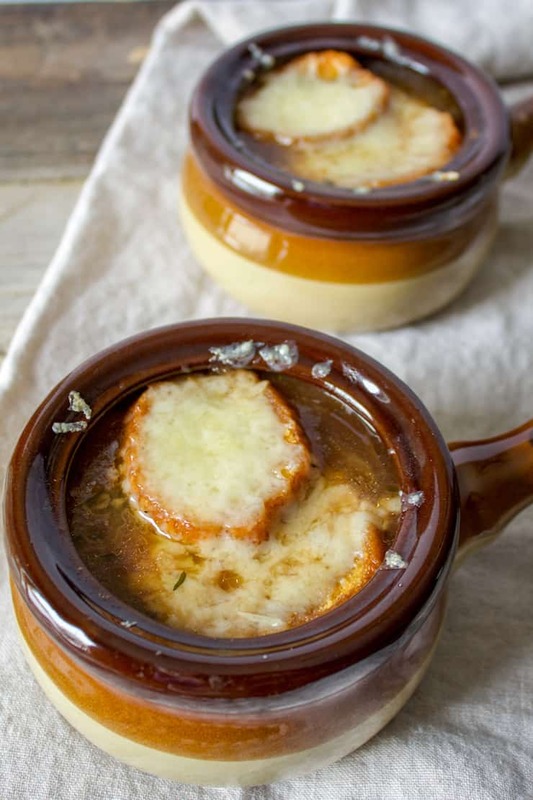 To serve, ladle warm soup into oven proof bowls, top with 2 croutons and a generous amount of grated Gruyère cheese. Place under broiler to melt and lightly brown. Enjoy! 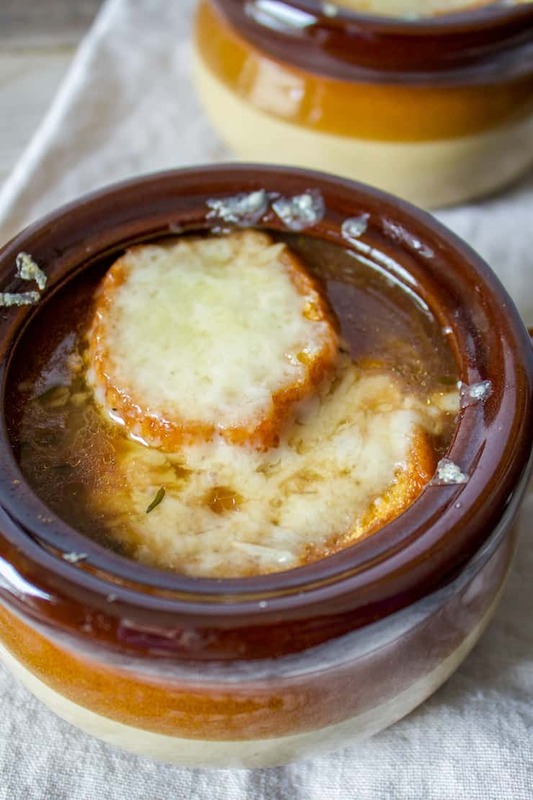 Try making French onion soup at home. You’ll be glad you did.